Q. Where do I find University of Denver Dissertations? Recent dissertations (1997 to present) can be found in the University of Denver Dissertations database. This is a subset of the much larger ProQuest Dissertations & Theses database. Older dissertations can be searched in our Compass catalog. 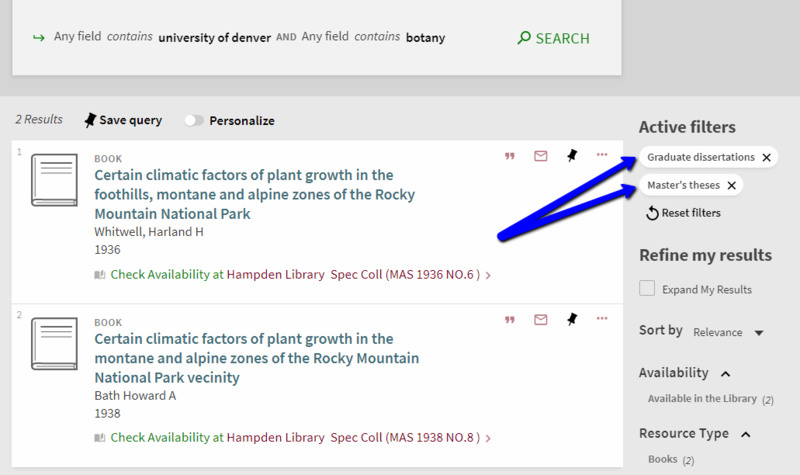 The easiest way to search for older dissertations is to include "University of Denver" as part of your search term, then use the Genre facet on the right-hand side of the results page to restrict your results to items like "Graduate dissertations," "PhD dissertations," or "Masters theses." The terminology might vary by discipline and era. See below for one example of this search process having been completed. The University of Denver Special Collections and Archives department only receives theses and dissertations that are reviewed by the Office of Graduate Studies. All other graduate final research projects, if they are retained, are typically managed by the degree-granting department. Not all graduate degree programs require a formal thesis or dissertation. Major research papers and other similar final projects completed as a fulfillment of a particular program that do not go through Graduate Studies are not deposited with Special Collections and Archives. Dissertations and theses deposited in Special Collections and Archives are searchable in the library’s catalog. If you cannot find the document in the catalog we recommend that patrons try searching within Digital Commons @ DU or reach out to these departments and programs directly. If you cannot locate a dissertation using the tools above, please contact the Research Center, and someone will assist you.